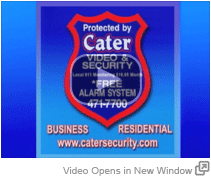 Cater Video & Security is a leading provider of professional security systems and alarm monitoring services here in the Evansville, IN area. Our local customer service, billing, and monitoring as well as our superior products set us apart from the competition. We serve a wide range of business and residential customers. Give us a call today for a FREE estimate and we’ll design a security solution that gives you the peace of mind your family or business deserves!